After buying an oven the very first thing that most beginners wish to try is baking a cake. But many times as it happens, the cakes do not turn out as good as we expect. To overcome this and bake a perfect cake a few tips have to be followed. 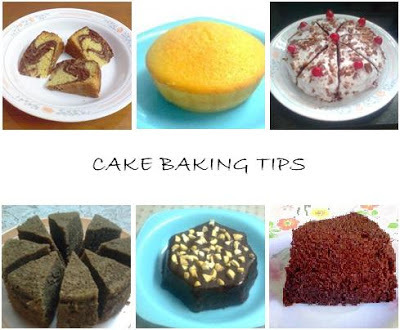 These tips would surely help beginners as they embark on their cake baking journey. All the ingredients must be at room temperature unless of course mentioned in the recipe. The proportions of ingredients must be perfect. Baking powder must always be used before the expiry date. To check if the baking powder is working, drop a pinch into a bowl of water. It should froth on coming into contact with water. Whenever mixing butter and sugar, make sure that the butter is at room temperature but has not melted. The flours must be sieved twice or thrice. This will result in soft cakes. The eggs must be beaten well as this will make the cakes fluffy and soft. Some recipes even suggest separating the yolks and whites and beating them separately to yield softer cakes. The recipe should be followed accurately. If you do not have butter in your pantry and you wish to substitute with oil, it is better to shift to a recipe using oil than replacing butter with oil for the same recipe. It is preferable to use aluminium cake pans for baking. The size of the pan should be selected depending on the quantity of batter. Don’t use large pans if your batter is less. Flat cakes of less than 1” height are usually not soft and might get hard or burnt if the temperature is not properly set. Always grease the pans with butter and flour it evenly before pouring the batter into it. Tap it to remove any excess flour. Fill the cake pan with batter up to half the height of the pan or slightly more depending on the cake you are making. If you fill it to the brim then there will be no space for the batter to expand and hence will overflow out of the pan. It is better to use the middle shelf of the otg with both upper and lower rods on to make sure that the temperature is even on all sides. Place the wire rack in the middle shelf and place the cake pans over it. The temperature to be set for baking a cake can be between 150 degree C to 180 degree C depending on the recipe. Preheating the oven at least for 10 minutes is a must. The temperature of the oven is very important. If you have set very high temperature, the outer part will be cooked but the inner side will remain uncooked. The time of baking different cakes varies from oven to oven hence it is better to keep a close watch about 5 to 10 minutes prior to the end of cooking time mentioned in the recipe. Never open the door of the otg during baking. Even after the cake is done it is better to switch off the oven and wait for about 5 minutes before opening the door and taking out the cake. Use a toothpick or knife to test if the cake is cooked. If the toothpick inserted comes out clean then the cake is done otherwise bake for a few more minutes at the same temperature. Remove the cake from the pan, only after the cake has cooled down completely. If you remove it earlier, the cake would stick to the pan and will not come out perfect. Always use a thick hand glove or towel and do not touch the surface of the oven as you can easily get burns if you do not handle your trays and cake pans with caution. I hope this post will be useful... Will update this page with more tips soon… Meanwhile you can also check out the page on how to use an oven to get more info about using the oven and the otg recipes page for recipes of cakes, cookies, etc that can be made using the otg. Seriously very useful post, fantastic tips. Fabulous and useful post dear :) Awesome work!! Great Post .Thanks a Ton. One Doubt. Can we use Wooden Skewers in an OTG? off course all this is useful.. good one ! Wonderful...new year is tomorrow and i will definitely try this tips to make good quality cake for myself. These is really nice to visit this page. Liked it very much. Nice tips. Very helpful, thanks for posting these type of blog. You may also visit http://www.monginis.net/send-cakes-to-india/ to buy cakes online anywhere in India. hi amina thanks for sharing all the tips.i bought a prestige otg 19ltrs.after reading ur post thoroughly for many times,i get an idea now.for baking cakes muffins etc. or for baking veggies bread pizza etc.i have to switch on both upper and lower rods, isnt it? this was the doubt i had.can i follow this?please help.and i ll beasking some silly doubts to u and kindly bear with me.